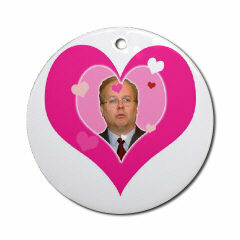 I Love Karl Rove: Decked out! RoveDay is well nigh upon us! Take a teeny peep at the RoveDay Countdown Clock to see how long you've got to deck  heck, whatever you want  for the holiday! Grab some holiday hangy things in oval, or round, like Rovey! They're sturdy and spongeable, in case festivities get exxxtra fun!